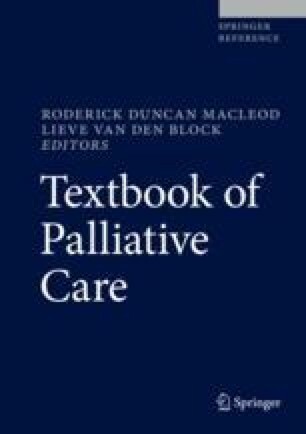 Although this chapter has its origins in the Dutch practice of palliative care at home, its message is relevant to all countries in which a considerable percentage of the population prefers to die at home. These people usually depend to a great extent on general practitioners to realize such a death at home. Although there are exceptions, many generalists lack experience with and/or knowledge of palliative care. These limitations show themselves most in complex cases and often result in the patient being hospitalized. This chapter provides a perspective on a potential (part of the) solution to integrate generalist and specialist palliative care at the patient’s home: teleconsultation. It describes how to empirically and ethically study such a complex, technological intervention within a particular care practice, with a focus on the fit of the technology. Teleconsultation technology should be considered non-neutral. It mediates the relationships between patients and their accompanying professionals, while also coshaping experiences of virtual proximity and real-time autonomy. It can also be a constant reminder of an approaching death. Teleconsultation appears to provide opportunities for professionals to experience responsibility for a patient’s suffering and to address it adequately, although its scripts do not fill the need for meaningful moments of silence. In the end, this chapter claims that teleconsultation can be of value to the practice of palliative homecare, if special consideration has been given to its careful use by professionals. Teleconsultation requires an open and humble attitude toward both patients and colleagues, as well as sensitivity for privacy issues. This chapter is an adaptation of three unpublished chapters from the PhD dissertation “Teleconsultation: enhancing personalized palliative care at home. An empirical-ethical analysis.” A PDF of this PhD dissertation is hosted at the Radboud Repository of the Radboud University Nijmegen. Wright et al. in WHO. Global Atlas of Palliative Care at the End of Life. http://www.who.int/nmh/Global_Atlas_of_Palliative_Care.pdf?ua=1. Published January 2014. Accessed February 4, 2018.